Are you interested in music, World War II-era history, or both? 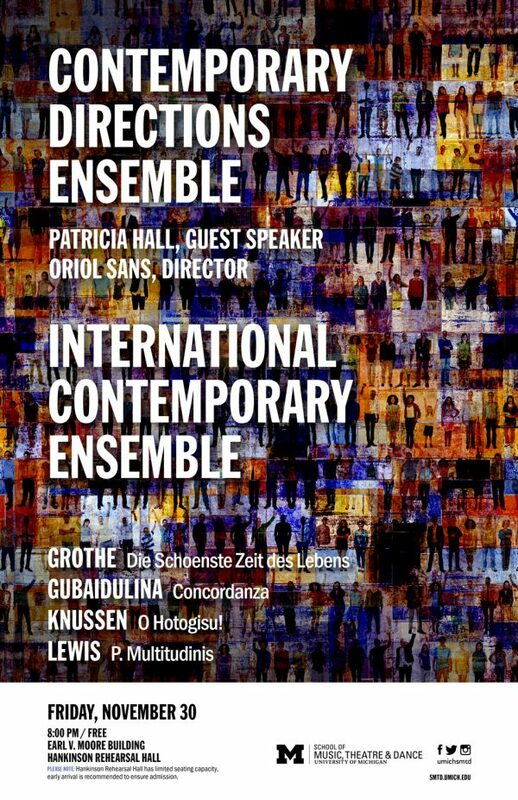 On Friday, November 29 at 8 pm, the University of Michigan Contemporary Directions Ensemble, under the direction of Dr. Oriol Sans, will be performing a concert in Hankinson Rehearsal Hall in the Earl V. Moore Building. The headlining piece of this concert is an arrangement of “Die Schönste Zeit des Lebens,” or “The Most Beautiful Time of Life,” a popular foxtrot of the 1940s. The manuscript of this arrangement was recently discovered by University of Michigan professor of music theory, Dr. Patricia Hall, at the Auschwitz-Birkenau Museum. It was arranged by prisoners at Auschwitz, and performed by the concentration camp’s orchestra. The Contemporary Directions Ensemble’s upcoming performance will be the first time that this arrangement has been heard since World War II. If you are interested in learning more about this fascinating discovery before the performance, check out the article at https://www.nytimes.com/aponline/2018/11/26/us/ap-us-recovered-music-auschwitz.html or watch the video at https://www.youtube.com/watch?v=csDc14TbF5Y. Admission to this event is free and open to the public! Seating is limited, so arriving early is recommended. If you have never been to the E.V. Moore Building, it is located on Baits Drive on North Campus, right by the pond. Follow this link for a Google map. Just walk down the sidewalk across the street from Pierpont Commons, or down Baits Drive from Bursley to get to it. Hankinson Rehearsal Hall is located down the hall to your right if you enter the building through the main doors, or straight down at the end of the hallway if you enter through the door near the pond across from Pierpont.